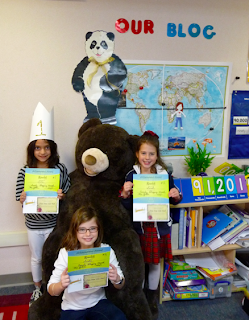 Mrs. Yollis' Classroom Blog: Family Blogging Month Winners! Family Blogging Month was a terrific success! Congratulations Leila, Sarah, and Sasha! 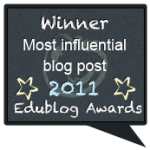 Each girl won a free meal at the Marmalade Cafe and an opportunity to publish a free-choice post on our classroom blog! Congratulations to our top bloggers! Thank you to all the parents, grandparents, aunts, uncles, cousins and friends for your participation! This When I Was Young... post is an amazing demonstration of how important and fun it is to include family in our learning. Please take a moment to check that post out! You're invited to add your story! We hope you will continue to participate in our learning community! What did you like most about Family Blogging Month? Which family members left comments and how did that make you feel? How did your family enjoy the month? Congratulations Leila, Sarah, and Sasha! Congratulations winning the Family Blogging Month. I have loved reading all your family and friends comments. I really don't have a favourite as I thought all the comments were wonderful! 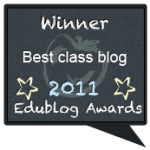 Am so looking forward to reading your free choice post on your class blog. I had a great time participating on this post. Not just reading our families comments, but reading other peoples family comments. I think a lot of the people in my family contributed for Family Blogging Month. My uncle left about two, and my parents left seven, and my brother left four. My families friends left comments too. Three of them did. I don't really have a favorite comment because I think all of them are great! What was your favorite comment Sasha, Leila, and Sarah? Do you have a comment that you did that you think you worked on very well? I am very excited to see you free choice post! P.S. I think it is extraordinary that high schoolers commented on our post! I really liked Family Blogging Month because all the parents get participate. I also liked family blogging month because we got to read all the other comments from parents. I am really looking forward to doing a free post on Mrs Yollis' blog. I don't really have a favorite comment because they were all fantastic. 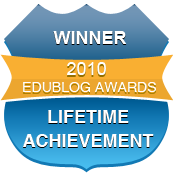 Congratulations, I did read most of your comments on the blog; you guys did a fantastic job. It is great to communicate with our class mates using the blog, and also communicating with our family and friends even overseas. 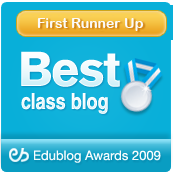 I really enjoy reading your class blog and look so forward to reading each of your personal blogs soon. 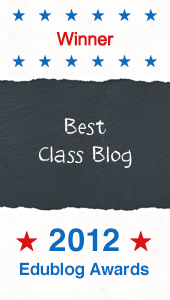 The class blogs have been a great way for me to feel more connected to my niece, Sasha and and the rest of you. My teacher friends up here in Humboldt Co. are really jealous of the wonderful teaching tools you have at your school and I think they will be starting some innovative blogging sometime soon with their classes.